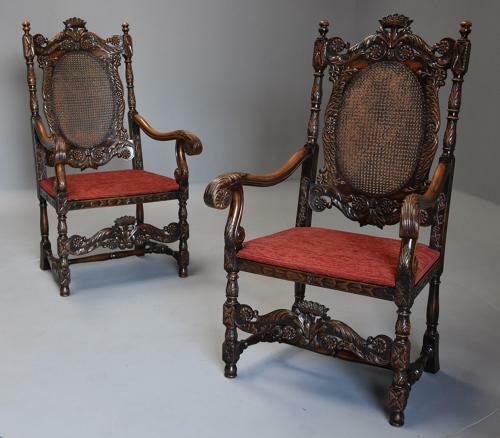 This pair of chairs consist of a superbly carved top rail with crown of flowers to the centre, carved scrolling foliate decoration and carved rosettes with central oval caned panel in excellent condition. The carved uprights being of banister style (typical of chairs from the Charles II period), these leading down to shaped and scrolling arms with carved foliate and rosette decoration with scroll arm supports. The seats are caned surrounded by carved rails, the cane work in excellent condition, the seats having an additional red upholstered cushion - this could easily be replaced with an upholstered cushion or swab once purchased in a fabric of choice. This leads down to a deep carved and pierced front rail with identical decoration to the top rail of a crown of flowers to the centre, carved scrolling foliate decoration and carved rosettes. The chairs are supported by turned and carved front legs, the rear legs being turned with outswept supports all joined with an H stretcher. This pair of chairs are in excellent condition for age, the cane work also in excellent condition, they are of stable construction and can go straight into a home.